My sermon from Christ the King Sunday (November 26, 2017) on Matthew 25:31-46. Listen to the recording at the bottom of the page or read my manuscript below. So what are the things you expect to see on Thanksgiving weekend? For me, I like to drive down route 17 and see the miles of cars trying to get into the Garden State Mall parking lot. Others, I know, are glued to the tv, watching football on Thursday, Saturday, and Sunday, and praying that their NFL team will do all they can to secure the #1 spot in next year’s draft. 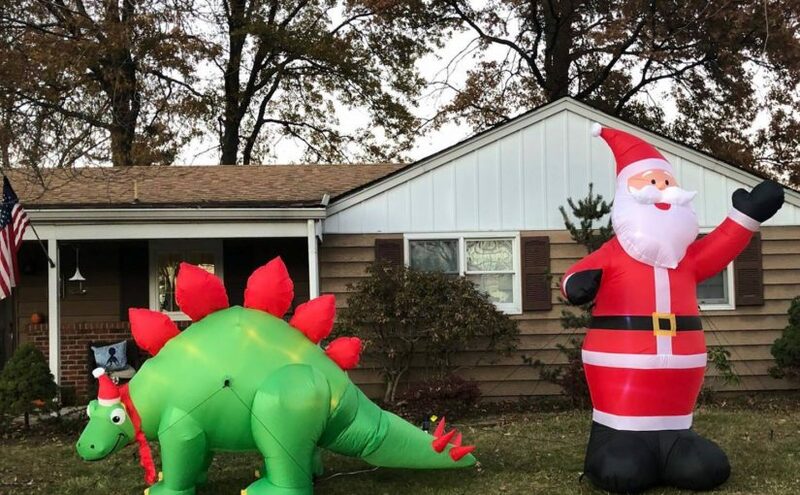 This is a weekend where some set-up Christmas trees, hang garland and lights, and place 9” long inflatable dinosaurs in Santa hats on their front lawns. It’s a busy weekend for weekend warriors, travelers, and all kinds of consumers. But it’s also a busy weekend for everyone who works. Even though more and more people spend their holidays shopping online, retail stores and malls still need a small army of employees to open, staff, and survive this ultra busy time of year. Thanksgiving weekend isn’t only the start of a season where we stuff ourselves full of turkey and eggnog and a huge amount of stress as we try to do everything and still find that perfect gift for family and friends. This weekend is also when hundreds of thousands of people will become a seasonal retail employee. As you stare at a mountain of tvs, trying to decide which one is right for you, the staff person who helps you might not be who you expect. It could be a college student trying to pick up some extra hours of work, or a stay-at-home dad trying to help his family stay afloat, or it could be one of the countless underemployed folks in this country who need these kinds of jobs to survive. Even pastors, seminarians, and interns take these kind of seasonal retail jobs. Now, that fact might surprise you since the holiday season is a busy one for pastors – but sometimes student loans, a health crisis, and an unexpected expense makes seasonal work a requirement for a clergyperson. That cashier you saw yesterday at Target could be, at this very moment, preaching in a pulpit. And I know this because, yesterday, that cashier/preacher posted in a clergy Facebook group a note he received from his new boss. The boss sent out a group-text to all the seasonal employees as they got ready for Black Friday. The boss wanted to remind them of the expectations management had. After writing about being on time and how to dress, they ended with an important piece in big, capital letters: “PLEASE ALWAYS BE AWARE THAT OUR GUESTS MAY BE TARGET EXECUTIVES. WE ARE TO TREAT EVERY GUEST AS IF THEY ARE.” It might surprise you to find out that the seasonal retail worker helping you might be clergy. But it’s probably just as surprising to learn that the management at Target is sharing with their seasonal employees a version of today’s reading from the gospel of Matthew. The sheep and the goats is not a parable only for the Bible. It’s a story for our modern retail life because you never know who you might run into while shopping this holiday season. Today’s passage from Matthew is an interesting text to chose to end the church year on. Starting next week, we are in a new year in our 3 year cycle through scripture and we’ll be focusing on the gospel according to Mark. You would think, since we’re starting with a new gospel, we would end this year with the last words from Matthew. But we don’t. Instead, we end with Jesus’ last public teaching before his betrayal, arrest, and crucifixion. We end our church year with Jesus standing in the Temple and talking about farm animals, visiting people in prison, and a final and fiery judgement. This isn’t the most hope-filled text to end the church year on. And it’s also a text where, if we were given the choice to pick which story today to use, the sheep and the goats would be a surprising pick. But maybe that surprise is why our 3 year cycle picked this text to end this church year on. Because this isn’t just a surprising text. It’s also a text with surprise built in. And did you notice that? The surprise the sheep and the goats both express? In today’s story, the Son of Man shows up in full glory. Everyone knows who he is and everyone understands that something important, amazing, and all-powerful is about to happen. No one doubts what’s going on. But they do have a question for this eternal judge. They are surprised to learn that this isn’t the first time they’ve met him. So Both sides wonder when they saw him last. And this judge, this Son of Man, answers them strangely. Because He simply tells them who he was with. Jesus was with the stranger who lived in their nation. He was with the hungry, the thirsty, the sick, and the ones who had nothing. Jesus was stuck in the prison cell with the justly and unjustly convicted. He was always there, in the open, with people we could actually see – but we, as a society and as individuals, chose not to see them. We keep our distance because they are different, or scary, or because we assume they brought this pain and suffering and poverty on themselves. We act as if they deserve their fate – and that’s who Jesus chose to be with. Jesus is there, hanging with the ones we don’t like, with the ones we don’t agree with, and with the ones who we label as the goats in our world. When we see the surprise in today’s text, we finally see how Jesus chooses to be with people, even the people we don’t think he should be with, because that’s just who Jesus is. God’s presence in our lives doesn’t depend on us having the title, or the wealth, or the good looks, or all those things society says we need to have to be seen and noticed by everyone else. Jesus is with everyone, especially the ones society doesn’t see, and that’s surprisingly good news. Because a God who chooses to be with people is a God who chooses to be with us; and with the person sitting next to us; and with that seasonal retail employee we might run into later this week. Jesus is right there – in the middle of places and events and with people we don’t expect him to be with. And unlike the management at Target, we don’t have to be afraid that a Target Executive might show up because we know that the king of kings, the Son of Man, this Jesus of Nazareth who was born in a barn and had an animal food dish for his first bed – we know that Jesus is with whoever is in front of us. And he’s also with us, because Jesus keeps his arms outstretched and open so that he, and we, can serve and love all.